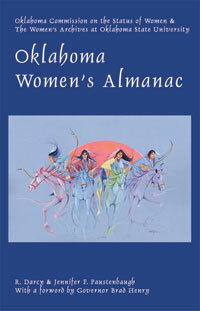 The Oklahoma Commission on the Status of Women voted to make the Oklahoma Women’s County Status Report a Commission project at their January, 2009 meeting. The goal is to make available a data resource for describing the status of women in Oklahoma’s 77 counties. 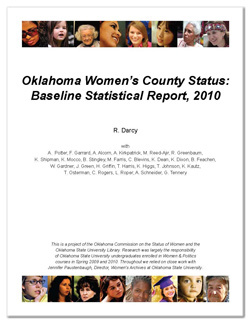 Oklahoma State University students enrolled in Women & Politics during the Spring, 2009 semester located and organized the data under the supervision of Commissioners R. Darcy and Jennifer Paustenbaugh with Lindsay Martin-Bilbry. Students enrolled in Women & Politics during the Spring, 2010 semester developed narrative material. Andrew Potter, a student enrolled in Elementary Statistics for the Social Sciences in Spring 2010, used ARCview to create maps to correspond to each table. R. Darcy added several sections of tables. A downloadable version can be viewed here. Oklahoma continues to be ranked as the state with the HIGHEST female incarceration rates in the U.S. The Oklahoma Commission on the Status of Women has voted to make this topic their primary issue area for the FY'10 year. 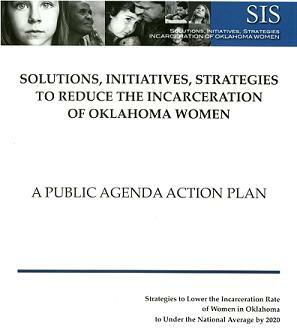 This issue of female incarceration rates in Oklahoma was the topic for the 2010 Oklahoma Women's Summit. This project won the 2010 Outstanding Achievement Award from the National Association of Commissions for Women. A downloadable version of the Public Agenda Action Plan can be viewed here.